There might be some cross posts, particularly since Python and the Raspberry Pi are used in so many innovations. That's what we tend to equate, cause we love them rockets... And, to reach space, it does require a rocket of some sort, at this point. To "explore" space however, at a minimum, only requires a cloudless night, away from the city, and there, with the naked eyes, you can watch the stars, not just a few, but hundreds (some apparently can see upwards of 3000!). Or perhaps you choose a full moon. One can get pretty close even with a 35mm or digital camera with a modest zoom and a tripod. Except that we are back to rockets again? Or are we? Both Fred's talk and mine that year talked about a near space option. Weather balloons will get you into near space. Space officially starts at 100KM, but one can reach 35-40KM with a latex balloon filled with Helium. Add a parachute, a radar reflector and a payload, and you have your own little private launch and recovery system. And nowadays, the payload options are numerous. The main thing is that we are no longer limited to sending microcontrollers, but can send actual computers running an operating system, and executing Python code. An obvious candidate is the Raspberry Pi. Dave Akerman (whom I had mentionned in my talk) has been sending them into space for well over two years now. 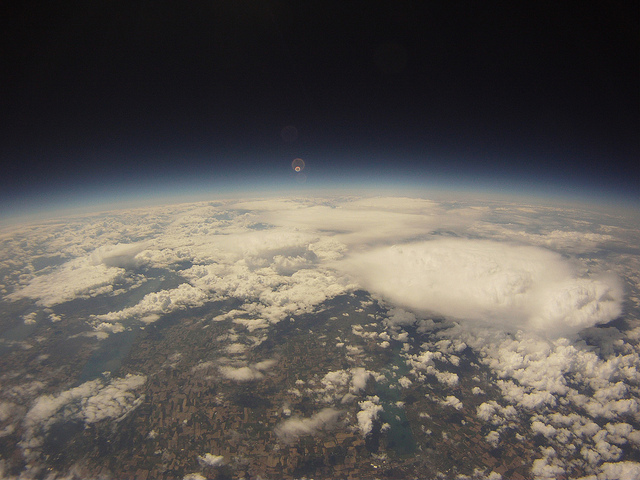 So when he sent a tweet earlier this month about the Global Space Balloon Challenge, I knew this would be the perfect project for our local Python user group, using a payload with Raspbian Linux and Python on a Raspberry Pi model A+. So many projects are possible within this project. "Ah oui vous utilisez Python. Je connais, c'est un langage de programmation pour écrire des petits scripts, ce n'est pas utilisable à grande échelle. Une connaissance travaille chez Bank Of America sur le programme Quartz. Ils sont passes de 0 a 5000 développeurs Python et des millions (plus de 10) de lignes de code en quelques années seulement. On parle de la même échelle pour YouTube. Les projets de 10 millions+ de lignes de code Python sont rares bien sur, mais ce n'est pas du a une raison technique, mais plutôt parce que l'on accomplis beaucoup en peu de lignes de code. You would walk in a supermarket, buy hot dogs and hot dog buns. It was a pretty straightforward process. Sausage pack, check. Buns, check. Then, someone had the idea of making a bun length sausage. Hmm, ok, except that different brand of "bun length" sausages and buns all have different metrics. But hey, that's ok, it was a valiant effort. Some time passed, and somebody thought, "hey, let's make a sausage longer than the bun!". Of course, all readers will be quick to point out that there never was a sausage exactly the length of a bun, they were either slightly shorter, or slightly longer. It was just a "more is more" marketing. You are probably expecting a sausage to appear on the market "shorter than the bun!". And the circle will be complete. But, which one is the better design? Which one innovates? Same answer to both question: the original design for sausage, which dates back to at least the 9th century BC. Anything beyond that is in the presentation (the marketing). Before I sign off for the day, do read my post on innovation in general and personal scale innovation from last year.